Game 4 of the NLCS is tremendously interesting on paper. Julio Urias against John Lackey is about as intriguing of a pitching matchup that you can come up with. On the one hand, Julio Urias is the youngest pitcher to start a playoff game ever. Ever! Meanwhile, John Lackey is four days away from his 38th birthday. This is his 22nd postseason start, which will pull him into a tie with Whitey Ford for the sixth-most in history. Obviously the addition of playoff rounds makes this easier to attain than it used to be, but the pitchers ahead of him are in a different class: Andy Pettitte, Tom Glavine, Roger Clemens, Greg Maddux, John Smoltz, then Ford and Lackey. Lackey’s first postseason start was in 2002, a month after Urias turned six years old. Now they’re matched together in the most important game of the season. The Cubs signed Lackey to a two year deal over the winter, and he has made that move look pretty smart. 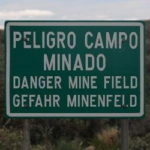 He pitched 188 innings this season with an 81 ERA-, 92 FIP-, and a 98 DRA-. Those numbers put him at somewhere between a number two and number three starter. 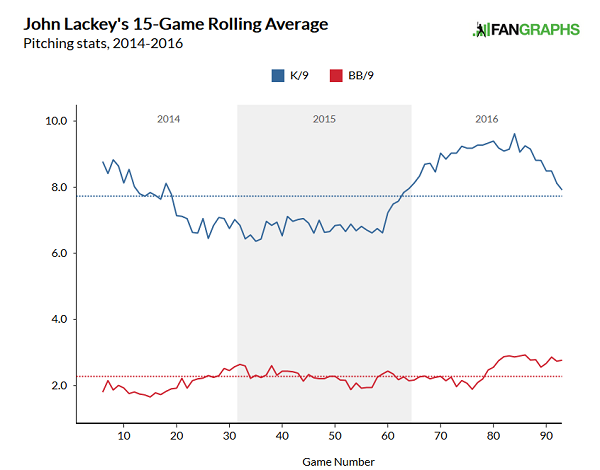 Lackey posted a 24% strikeout rate and 17% strikeout-walk differential, both career highs by wide margins. 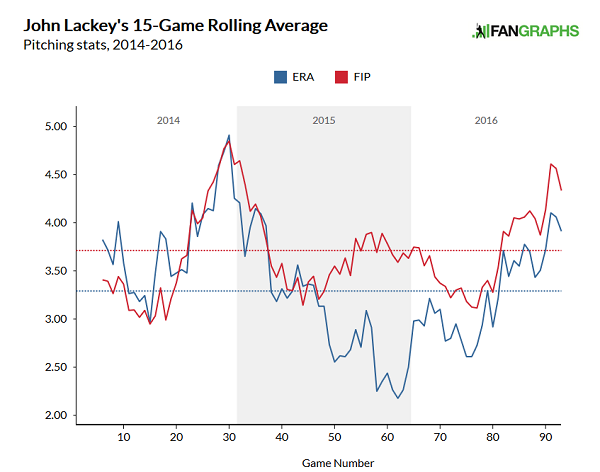 Lackey hasn’t changed his repertoire or pitch usage much since last year: he leads with a lower-90s fastball and a mid-80s slider while mixing in a two-seamer, change, and hard curve. His whole season is the most accurate bar to project with, but that’s not a direction which you want to be moving in. Lackey started once in the division series against the Giants. His velocity was up quite a bit; he only averaged higher on his fastball four times this season, the most recent being in June. Still, the Giants managed to chase him pretty quickly. Lackey pitched four innings, gave up three runs and seven hits while striking out four and walking two. Lackey didn’t give up a huge hit (one double and six singles, including one by Giants pitcher Matt Moore) but it wasn’t exactly a stellar performance. This left the Cubs in a hole, one which they dramatically removed themselves from in the ninth inning, eliminating the Giants from the playoffs. Against Lackey is the normal Dodger platoon lineup with a ton of left-handed hitters, and Eno Sarris wrote a post on Lackey’s platoon splits last week. Essentially, they are much smaller than last year, but it’s difficult to see exactly why. He has gone back to pitch mixes he used when he was a worse pitcher, but the results are better. He is throwing harder on his change which helps, but there isn’t a clean explanation, which likely means some regression can be expected. Julio Urias is 20 years and 68 days old today, making him the youngest pitcher to ever start a postseason game. When he takes the mound in the top of the first, he will break Brett Saberhagen’s 32-year-old record by over 100 days. The only other postseason starters under 21 were Bullet Joe Bush (great name), Jim Palmer, and Fernando Valenzuela, who started five times as a 20 year old, helping to lead the Dodgers to their title in 1981. Rather than tell you what to expect from Urias, you can read Dustin’s post from this morning. A win today will put the Dodgers in an extremely good position to move on to the World Series for the first time in 28 years. A loss resets the series yet again and tilts the odds towards the Cubs. Some of the worst heartbreak since 1988 has happened in Game 4 of the NLCS, but happily even if the Dodgers lose they will not be buried. Still, this is the best time to pull ahead, if only for the fans’ sanity.